Click on image and use magnifier to enlarge. The last few months of Menshevik rule saw the appearance in Tbilisi of speculative overprints on Georgian stamps, the National Guard and "de jure" issues. In the same period, the very doubtful Constantinople "Consular" overprints were produced. The months after the Bolshevik seizure of power saw the production of numerous fantasy issues in Constantinople, to which city members of the Georgian stamp trade had evacuated themselves, taking with them extensive stocks of Georgian stamp issues. They may also have taken one or two genuine cancellers. At the top of the page is a cover with a pre-printed header for Z.Y. 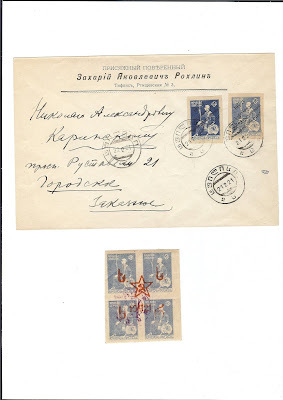 Rokhlin (Rockling), franked with two examples of the "de jure" stamps in different shades. These are cancelled with what Ashford lists as a genuine Tbilisi cancellation (Type 22)dated 21 2 21. But the "receiver" cancellation (the cover is obviously philatelic and has never travelled)dated 22 2 21 is one which Ashford has down as a forged cancellation (page 151) on the grounds that he has "never seen a "z" datestamp used other than in the company of material originating in Constantinople" (page 151). Now the style of the 22 2 21 datestamp is quite a good approximation to the style of other Tbilisi datestamps (there are a lot of them - it was a big city) and the ink with which it is applied is in character with normal post office ink. The cover is signed "Romeko Paris". Now Romeko's surname was in fact Rockling (first name, I think, Serge - so the cover header is the name of his father or another family member) and he had made his way to Paris from Tbilisi via Constantinople. In the latter city, he was a member of the group which produced numerous fantasy issues. Despite this, Rockling / Romeko was extremely careful in applying his house mark: it is rarely if ever seen on forged material. Also on the scan is an example of one of the Constantinople fabrications: the red Star overprints on blocks of 4. Here one of the reasons for regarding the cancellation as forged (as Ashford does - page 152) is that it is applied in an ink never seen in Tbilisi.